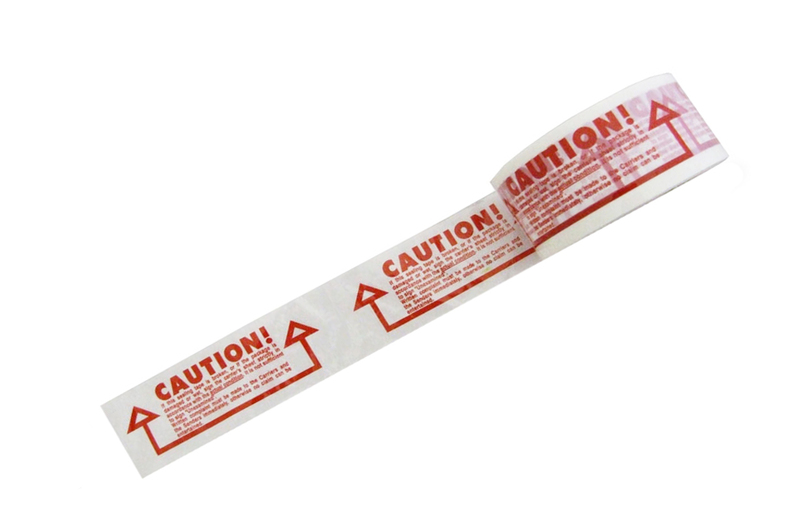 This polypropylene caution adhesive tape serves as both a warning to handlers and a reliable parcel sealing tape when you are packaging anything that needs special care. Caution adhesive tape is ideal when posting, shipping or storing goods and is a convenient warning sticker for removal boxes, as well as being an excellent packing tape. Our printed caution tape is a top grade polypropylene adhesive tape that’s perfect for sealing cardboard boxes while at the same time alerting people to the need for extra care – so it conveniently does two jobs in one. Being easy to use with a tape dispenser, it is a great packing tape for workers in busy warehouses or shipping departments. A durable adhesive tape with superb ‘stickability’ and resistant to moisture and temperature change, this is an ideal sealing or warning tape for sticking on export shipping packages, house moving boxes or items for storage. Its eye-catching vivid warning text, printed in bright red on a white background, will not fade or get scuffed. This caution tape is an adaptable adhesive tape as it is also suitable for use as a general warning tape, especially in work or school environments, or a tamper-evident tape for parcels.